Despite the claims of mythologists from both sides, the Chinese Nationalist Party (KMT) and Chinese Communist Party (CCP) were created in their modern form at the same place, at the same time, by the same people. The (re)creation of both parties was sponsored and guided by the Soviets as part of a strategy to throw out the western Empires from the East. As originally intended, the KMT would be the ruling party of a united China that would sustain the national resistance to the encroachments of Britain, France, Germany, Japan, and other Empires. The CCP would serve the dual roal of ’tiling’ the internal dynamics of China in the direction of the Soviet Union, while also serving as a mechanism for the Soviet Union to guarantee that restive leftists stay with the KMT, even when their short-term interest would lead them into an alliance with the west against the KMT. Thirdly, the semi-colonial countries, like China, Persia, Turkey, and all the colonies, which have a combined population amounting to a billion. In these countries the bourgeois-democratic movements have either hardly begun, or are far from having been completed. Socialists must not only demand the unconditional and immediate liberation of the colonies without compensationâ€”and this demand in its political expression signifies nothing more nor less than the recognition of the right to self-determinationâ€”but must render determined support to the more revolutionary elements in the bourgeois-democratic movements for national liberation in these countries and assist their rebellionâ€”and if need be, their revolutionary warâ€”against the imperialist powers that oppress them. The establishment of such a free “bourgeois-democratic” China was nearly completed under the benevolent sponsorship of V.I. Lenin and Josef Stalin, the tireless efforts of Zhou Enlai, and the hard-bargaining cooperation of Chiang Kaishek. While the establishment of a Chinese government of China of the people, by the people, and for the people was delayed quite a while because of a librarian, the important point is that the CCP and KMT are purposefully mirror images of each other. The Government is an Emanation of the Party. Government officials are not decision makers. They are managers. The Military is an Emanation of the Party, not the State. Thus, the Military can be expected to be more concerned with political threats to the Party’s leadership than international threats to the Government. The Party is run along the Leninist principle of ‘democratic centralism.’ That is, once the ‘center’ makes a decision, all members are expected to support it without question. In practice this is similar to the role of MPs to Ministers in the Westminster Cabinet System. The Party is concerned about private organizations not because they are private, but because they are not infiltrated by the Party. Corruption is a benefit for the Party’s control, by aligning the interests of ambitious officials with the political interests of the Party. Activities that would be considered “criminal” in a western context, because it involves explicit violation of the laws of government, way be wise if they are directed or guided by the Party. The Party cultivates an environment of self-censorship, not out of fear, but out of desire for promotional opportunities within the Party. An individual can leave the Party at any time, but ambitious individuals are more likely to ingratiate themselves to the Party. The Party is secretive and distributed, which provides a form of shadow federalism. Competing bureaus and committee operate without each others knowledge. The Party’s greatest trick, perhaps, is acting as if it did not exist. In the People’s Republic of China on the Mainland, the [Chinese Communist] Party does not legally exist, it has no property, no income, no employees, and no registration number. In the Republic of China on Taiwan, the [Chinese Nationalist] Party sustains hegemony in a democratic system. The Parties may well form a United Front in the future, combining their operations under the mandate to bring a government of, by, and for, the people to the China. The ability of the Parties to thrive may well owe a lot to the combination of Confucian Bureaucratic Theory and the National Examinaiton System which has guided China for two thousand years. Indeed, that combination has been so strong only one man has posed a serous threat to the survival of the Parties since their establishment by Sun Yatsen, Song Qingling, Wang Jingwei, and Mikhail Borodin in 1924. 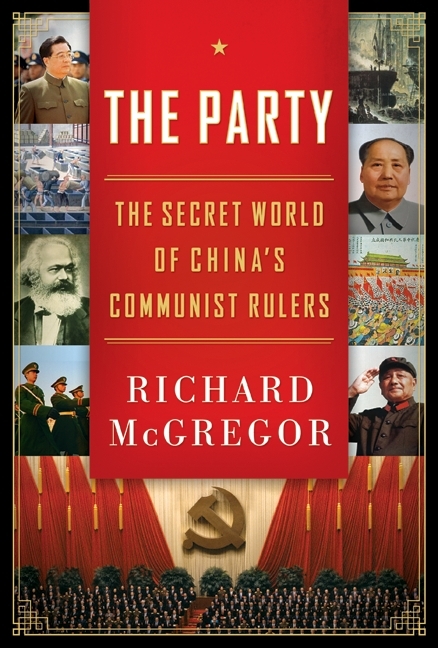 I recommend The Party, which is available from Amazon in hardback and kindle editions. Also check out the take from CNReviews. M1 — thanks for the the awesome bitly link! I am delighted that my blogfriend Zenpundit has started the book, too!